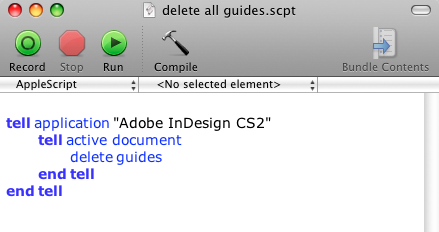 if you’re using InDesign and you’re NOT using at least one library, you’re probably a loony. a library stores all your most commonly used stuff : logos, images, graphics, even text. you could think of a library as a type of permanent clipboard. a clipboard will only hold the last thing you copied, a library will hold as much stuff as you want. library objects also retain their styling so it’s also a great way to store swatches, styles (paragraph, character and object) and effects such as dropshadows and whatnot. 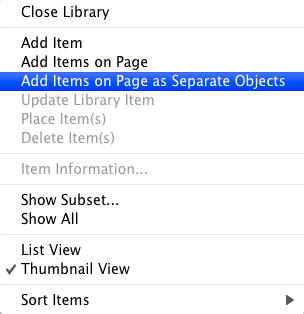 now whenever you need something just drag it out onto your page. if you have ‘paste remembers layers’ turned on in your layers palette, the object will even be pasted on the correct layer (ie. the layer it was on before it was added to the library). there’s no limit to the number of different libraries you can have — go sick. although you may find that anything more than about 25 may become a little difficult to manage. surely it’s obvious, when there’s only one document open, that the document is active. why can’t we just write ‘tell document’? who knows, it’s just the way it is, so you’ll have to get over it. that’s pretty handy if you only need to swap the active document once or twice, but as you get more adventurous you’ll be wanting to swap between more than two open documents, or swap backwards and forwards a lot, and it becomes virtually impossible to keep track of which document is active at any given point in your script. set active document to every document whose name is "CodeNo_Calendar Title_C.indd"
set mgTemplate to every document whose name contains "CodeNo"
you can use anything you like as your variable name, as long as it doesn’t conflict with any of applescript’s recognised terms or commands. 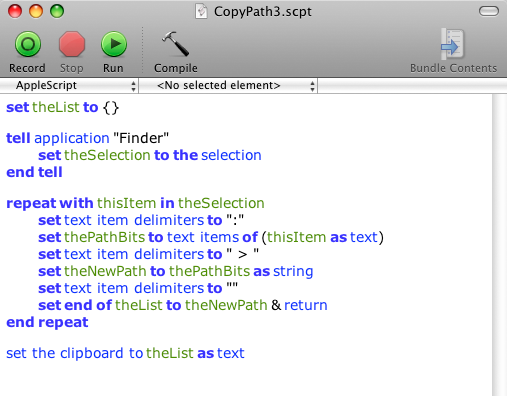 scripter’s will often use things like ‘myTemplate’, my_template’ or ‘theTemplate’ — whatever suits your style. 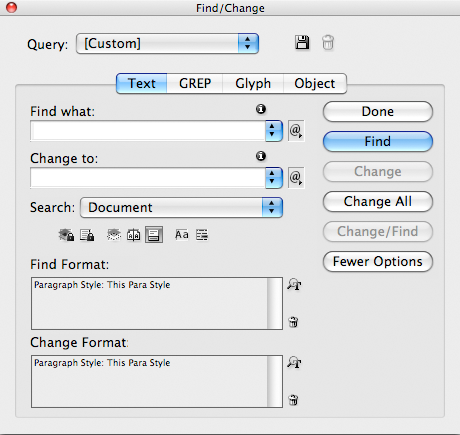 you probably already know that you can target your find/change routines by specifying a paragraph style and/or character style. 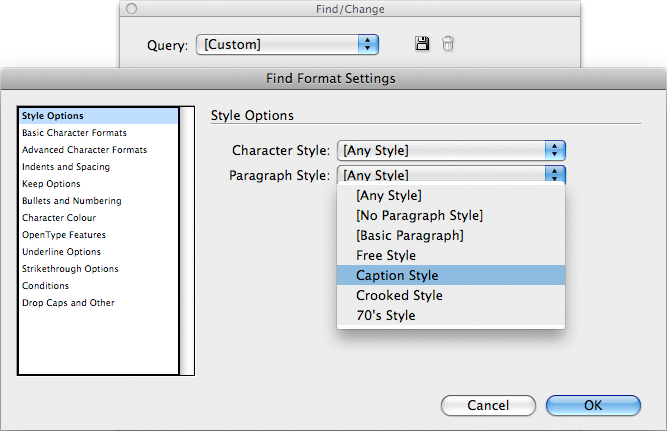 that is, for example, you can search only your captions by restricting the find format to your caption paragraph style. and if you know that, you probably also know that you can restrict your search by any text formatting parameter : only 10pt text; only Arial text; only underlined text coloured purple; whatever. 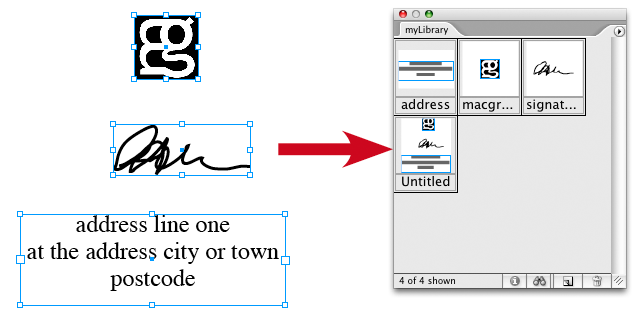 but here’s another find/change trick you may not be aware of … handy for documents that have become hideously misshapen by lots of unnecessary style overrides (not one of your own documents, obviously — one that has been messed up by someone else). 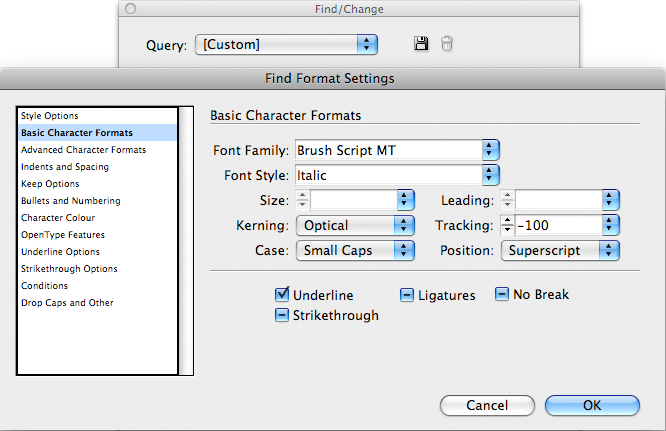 you can use find/change to quickly clear style overrides if you leave the ‘find what’ and ‘change to’ fields blank and set the ‘find format’ and ‘change format’ fields to the same paragraph style or character style. hit change all and any overrides for that style will be wiped out. or, if you’re feeling a bit cautious, you can of course find/change each instance individually. 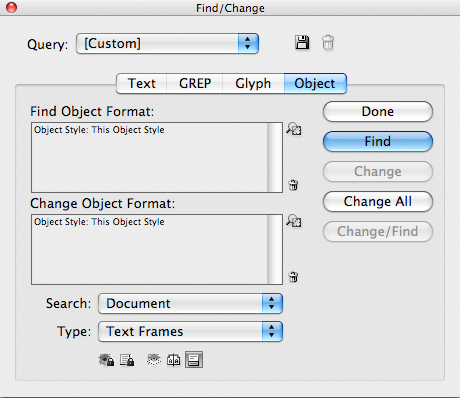 and you can do the same thing with object styles (after CS2). 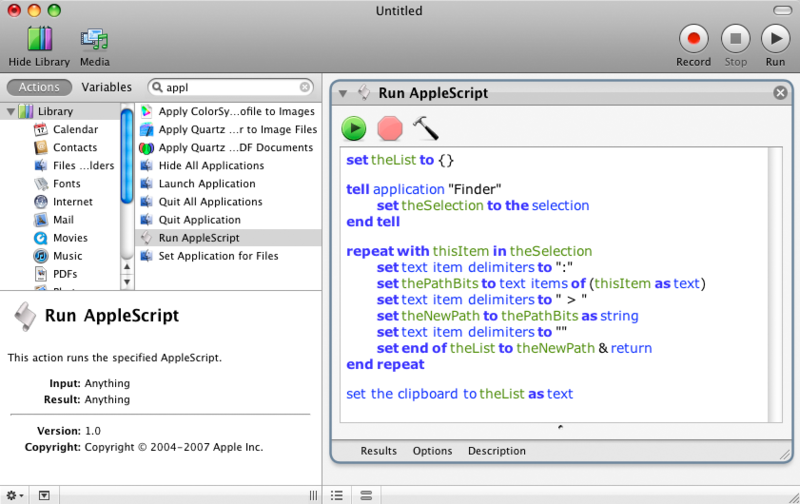 macgrunt is all about workflow optimisation, with an emphasis on automation, particularly applescript. some people may think “oh, I’m a Designer, you can’t automate design.” — which is absolutely correct. but there are many many tasks in a studio which are NOT design. and if you can get those done and out of the way quickly, it gives you more time to do the creative stuff. imagine you have to take all the content from a sales flyer and copy it into a designed calendar template, scale and place all the elements throughout, then duplicate those elements to the back cover, update the colour, add the product code and barcode, and save the new file with the correct filename in the correct folder. got that? ok, now imagine you have to do that for over 60 calendars — every year. calendars is a quick animation which shows an actual script performing a real-life task in a fraction of the time it would take a real-life human. the animation is built from screen grabs from the actual workflow — so those dialog boxes showing how long the script took to do each job are real and accurate (testing was done with CS2 on a G5 PowerPC running OSX 10.5.7). if that doesn’t convince you to start learning, stay tuned, more to follow.